early spring, but you must use good judgment. The soil should be evenly moist, but not wet or soggy. If the soil is water logged when you dig, not only will you risk “caking” the soil, your seed potatoes will probably rot before they even get started. A day or two before planting, use a sharp, clean knife to slice the larger seed potatoes into two seeds. Each seed should be at least 1 1/2-2inches in size, and must contain at least 1 “eye” or bud. Smaller potatoes may be planted whole. Over the next couple days the cut side of the potato will form a thick callous over the cuts, which will help to prevent it from rotting once planted. 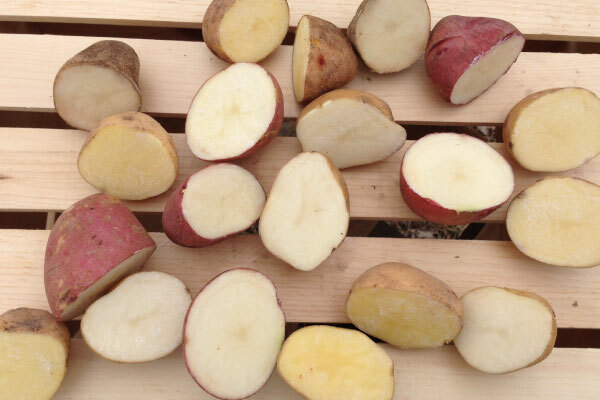 Average Yields: Potato yields will vary but on average you can expect a 1:8 ratio. For every 1 seed potato planted expect 8 for harvest. 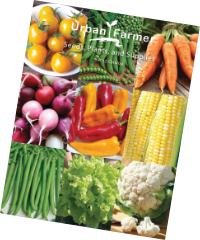 This can vary widely depending on varieties, soil conditions and location. In weight, expect 3-5 lbs of potatoes for each plant.